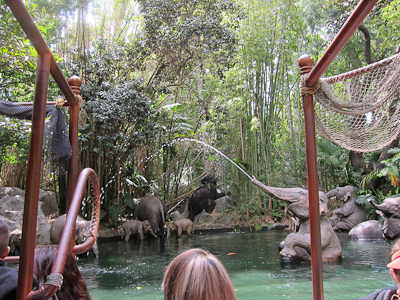 One of my very favorite rides at Disneyland is the Jungle Cruise. 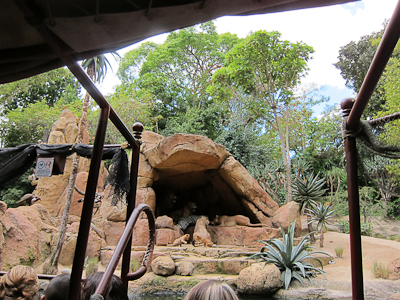 The Jungle Cruise is one of the original Disneyland attractions on opening day. 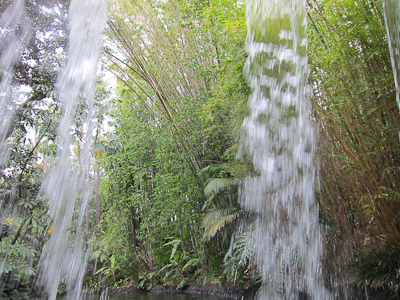 In fact, the Jungle Cruise was one of the first built, since Walt wanted the foliage to grow. The setup is pretty straightforward–you board a boat and float through varying rivers of the world looking at all the animatronic animals. The best part, though, is the running patter of jokes that your skipper tells along with his or her “tour guide” narration. Meet some new MYWTMouseketeers! 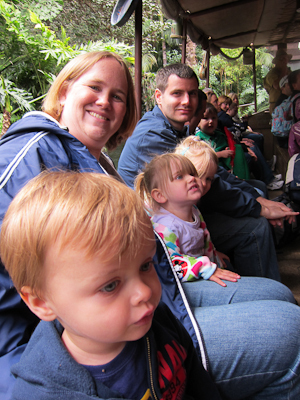 Melissa, Tom, Sarah, and Jenna joined Theo and me on our jungle adventure. 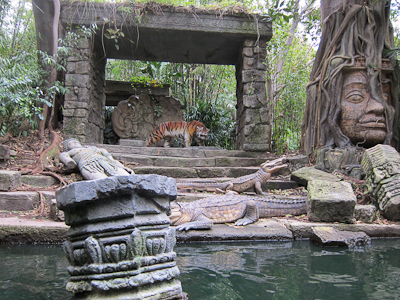 The Jungle Cruise is located in Adventureland next to the Indiana Jones Fastpass machines. In my youth, I remember the queue being very boring and just a lot of zig-zagging. Luckily somewhere along the line they redid it, and now it’s quite cute. From your beginning line, you can actually see the loading dock, which gives you the illusion that you’re almost there. Instead you get re-routed to the back of the building. There are nice things to look at though. If I were going on a safari, I'm pretty sure these are not the things I'd be taking with me. Then you round a corner and again you see people right at the loading dock and you think woo hoo! I’m almost there! 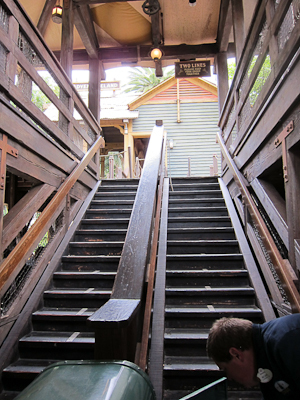 Well that was the case for us on this trip, but when it’s crowded you get another “psych!” and have to go up these stairs and back down again. 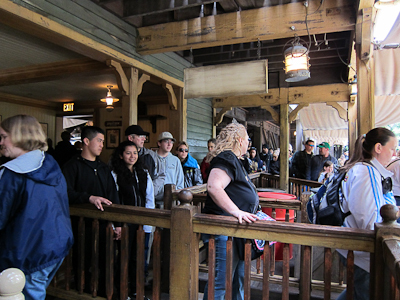 If you’re lucky, you may see a cast member emptying the trash can! However, finally you do make it to your boat. Everyone sits in an orderly fashion so it’s not like a Southwest Airlines choose-your-own-seat thing. The thing that’s kind of a bummer is that sometimes it really does matter where you sit. This trip we got stuck right next to the engine in the back. This was problematic for a couple of reasons. One was that our skipper’s voice was rather soft. I don’t know if the microphone was a bit anemic or if he wasn’t talking directly into it, but we missed about 75% of the jokes. 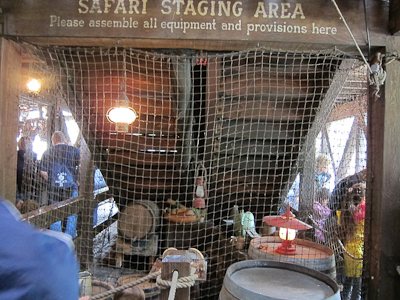 And since the whole point of the Jungle Cruise is the jokes, that’s disappointing. 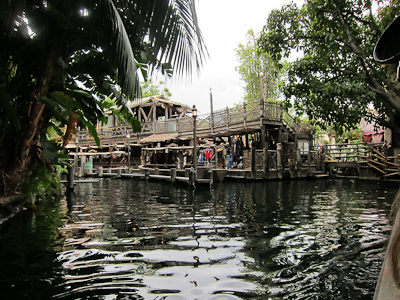 The other bummer is that there are a couple of things that happen on the attraction that happen in the front of the boat, namely the elephants squirting water at you when you think you’re going to get wet, and the hippos with their wiggling ears. If you’re not near the front, then you can totally miss these events and the jokes that go with them, particularly if you can’t hear the skipper. "These tigers are known to jump as far as 20 feet! Good thing we're only 15 feet away." There’s a very cute elephant bathing pool. It’s like Dumbo without the circus and flying. So basically it’s nothing like Dumbo. The thing that’s kind of funny is that I’ve grown so used to rides like the Jungle Cruise and the quality of animatronic animals that when we went on the safari ride at Animal Kingdom, I had to continually remind myself that we were seeing actual animals. There’s a short bit of narrative in that there’s this camping party and gorillas have invaded their camp and the party is nowhere to be seen (except like 2 minutes later). Now this is one of my favorite scenes in the ride, and our skipper totally blew the best joke for it. Oh, first I should probably mention the joke script. There’s a long script of jokes for the attraction. Skippers are allowed to choose any of them for the ride, but they have to stay to script-approved jokes. The end result is that (in theory) each cruise is different. If you ride it enough you get to recognize some of the jokes. I personally have my favorites, and our skipper didn’t use most of them. Anyway, in this scene which is obviously difficult to photograph, there’s a dead zebra lying in a cave and a bunch of lions sitting around it. I mean, there’s no chunks of zebra hanging out of their bloody muzzles or anything, but it’s pretty clear that the lions are having dinner. Check the picture for my favorite joke. "Awww, look at that--the lions are protecting the sleeping zebra. How sweet!" Another prominent feature of the ride is Schweitzer Falls (favorite joke: “And here’s Schweitzer Falls, named after the famous Dr. Albert Falls”). You pass Schweitzer Falls twice, once in front and once in back. "It's the back side of water!" And then you pass some more stuff that I didn’t photograph because this is an effect-heavy ride and also Theo was seriously considering taking a swim. Also, they added this pirhana part and it makes a lot of noise and these fish go jumping out of the water and even though I’ve been on this ride a million times, it still startles me. And then you reach the dock again. "Here's the most dangerous part of the cruise--the return to civilization"
I have to say, if I could choose any ride in the entire park, I would choose to be a skipper on the Jungle Cruise. I really think I’d be excellent at it. Ah well, a girl can dream. Shelby ~~~ how fun!!! 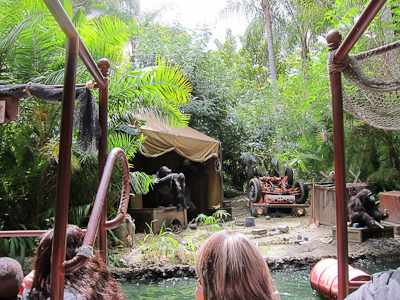 I adore the Jungle Cruise also, so we will have to ride it together next time. 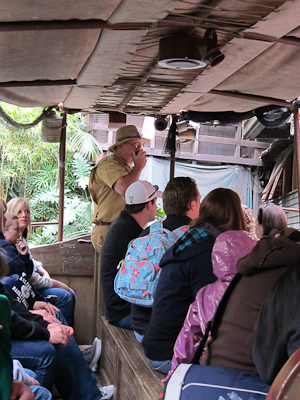 When I was at LMU, one of my co-workers at my work study job had been a guide on the Jungle Cruise and would give the spiel…….so funny, even without the ride. Did you know you can ask for a map at the end of the ride???? It is really cool!!! Heh! I said the same thing when we were at Disneyland – that’d be my pick for which ride I’d want to work. Apparently it’s not an easy job to get. 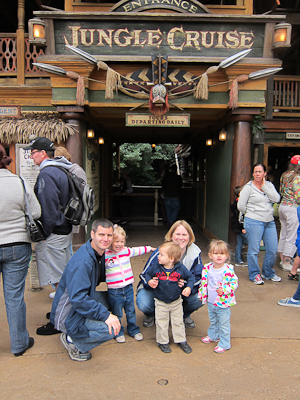 I’m so glad you blogged about Jungle Cruise, it’s one of my favorites, too… and so sorry you got stuck in the back, that really is a bummer! do you remember that Nixon’ s press secretary was a former Jungle cruise skipper? scary. maybe that is why they have approved list of jokes. i think you would be a FANTASTIC skipper. i would go back on the ride if you were the skipper. What a cool piece of trivia, Barbara! Thanks! At the very, very, very end of one late night a while back, a few friends and were the only passengers on a boat. We had all been on the ride a hundred times and we had almost talked the skipper into doing the tour he would do for other skippers… and then, a couple with a toddler dashed in to catch our boat… I always hope there will be a future trip when we’ll get that tour! site, and your views are nice in support of new viewers.